I’ve gone on about 15 week-long cruises to date — and absolutely love them. There’s no more carefree way to travel. In fact, I just returned from a seven-day cruise to the Caribbean on the new Regal Princess a few hours ago! Went on a number of cruises with my parents, my sister and my son; a former boyfriend; and with several girlfriends — and they were great. But lately I’ve enjoyed traveling solo — having a relaxing week reading books, sleeping late, going on shore excursions and doing whatever I want. Also took a number of Royal Caribbean cruises, too, and enjoyed them. 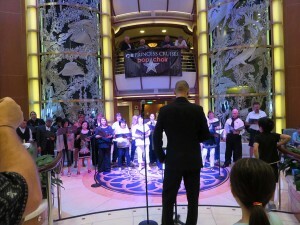 However, after my last (dreadful) Carnival experience, I tried Princess Cruise Lines. Wow! What a vast improvement for only a little more money! There were tons of new and exciting things to do — in fact, so many that it was hard to choose because several things were usually taking place at the same time! And there were also no drunken people next door shouting on the neighboring balcony and banging on the walls at 3 a.m. after the bar closed (like on my last Carnival cruise). The un-party ship was fabulous. I went to the fitness center, walked on the running deck (seven laps equals a mile), and took Zumba and line dancing classes — enabling me to eat cheesecake for dessert every night without gaining (much) weight! Every evening after dinner, went to a live performance (comedian, etc.) 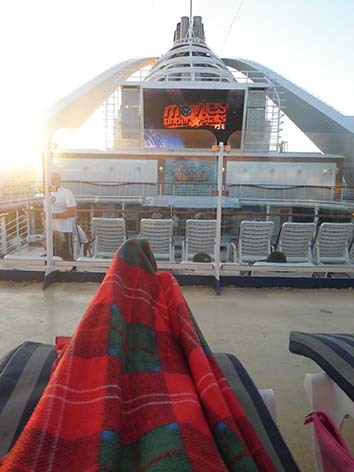 or bundled up in the wool blankets provided and relaxed in a lounge chair on the top deck to enjoy new movie releases on the big screen (like an old-fashioned drive-in theater, only at sea). They even served popcorn — and cookies and milk. The one thing I didn’t do on the first Princess cruise — and did on this recent one — is participate in the Princess pop chorus. Any guest on the ship can join a group who performs 70s rock songs on the final evening of the cruise (no try-outs necessary). Talked with a couple at the pool on my last cruise who did it and they said it was a blast. Went to see the performance and you could tell everyone was having a great time. So I took part this time — and it was really a fun experience. Why not? Doesn’t everyone like to sing feel-good music like “Under the Boardwalk” and “Hit the Road Jack”? And who’s ever going to see you again? 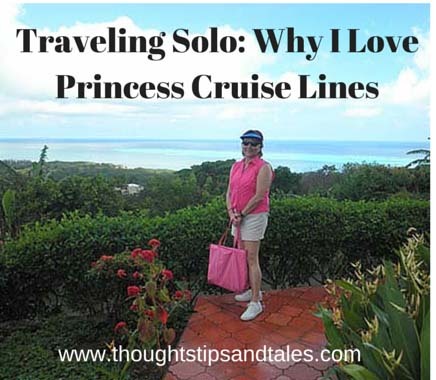 Royal Caribbean cruises are nice, and Carnival cruises are… um, reasonably priced — but Princess is the way to go. The week seems really short and you won’t want it to end! This entry was posted in cruising, cruising solo, princess cruise lines, single travel, solo travel, travel, traveling solo, vacation, why i love princess cruise lines' and tagged acrobatic alphabet, cruising, princess cruise, single travel, solo cruising, solo travel, solo vacations, why i love princess cruise lines. Bookmark the permalink. Hope you have a blast! Looking forward to see the pics! OK, Diane, you didn’t mention the friendly Okie couple you met on board! We loved the Regal cruise–such a pretty ship, new and clean. Hard to come home. Great to meet you. Hope you have a wonderful holiday season!! Hi! I told a couple friends about you, though — does that count? Merry Christmas to you! Ooooooh, I like zumba pretty much. But with my busy schedules, I don’t have time to do zumba. So, I should treat myself into cruising Princess do zumba. It is in my bucket list now.